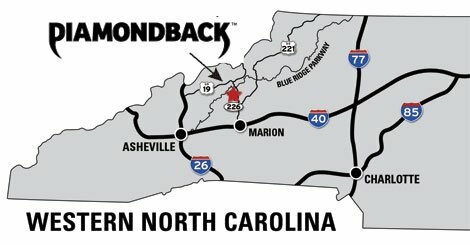 Although only about 12-miles long, this exciting sportscar and motorcycle route features at least 190 curves (some say as many as 200) as it links NC 226 to the Blue Ridge Parkway. At the peak of the Diamondback is the Switzerland Inn and Chalet Restaurant (Mile Post 334). Riding or driving the Diamondback through Pisgah National Forest not only takes you alongside heart stopping views of the Blue Ridge Mountains, it is a refreshing climb with as much as a 12-degree temperature drop and a great escape from summer humidity. Generally traveling north-south, 226A is entirely within McDowell and Mitchell counties. The Diamondback parallels the Blue Ridge Parkway along much of its northern segment.